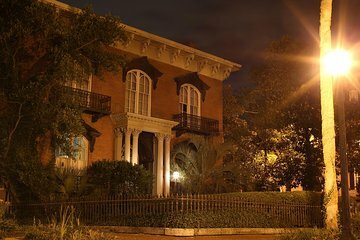 Take this Sixth Sense Savannah Ghost Tour and experience the thrill of the original. Follow your expert guide through the haunted sites and spooky landmarks of Savannah on this 'Adults Only' tour. This two-hour walking tour experience meets outside Clary's Cafe and requires advanced reservations. It's sure to be a highlight of any trip to this southern gem. Our tour guide was very knowledgeable and personable. It was raining fairly heavily during our tour adding to the ambiance. More of a straight historical history of true crimes as well as reportedly possible haunted locations. Our guide grew up in Savannah and had been in many of the places he told us were haunted and knew people who had experienced unexplainable sightings. Even if you are skeptical the tour is interesting and fun. Tour was awesome!! Ash is a great orator !! Fun, interesting and fact filled ! Thanks Sixth Sense ! Was a good narrative trip. Guide was enthusiastic and knowledgable. Wish there were more houses included. Did catch good picture of small child in window at one of the houses. Our tour guide, Eliza? (Sorry, forgot her name) was amazing and super knowledgeable, we were highly impressed and entertained with the stories. The only con was we were under the impression that this was an 18 and older tour, but there were some adolescence/teens the mix who were a little annoying. Interesting and informative host......hands on the show and tell pics and recordings....really enjoyed it!!! I would not recommend the tour to anyone. The guide was covinced of "his (self identified) wisdom. He seemed to enjou hearing his own voice. Ghost stories were well presented and excellent, but dragged out a bit too long. Tour could have been done in less time without compromise and wouldn't have required several folks to look for a seat to rest. Tour was interesting and informative. I would recommend to a freind.